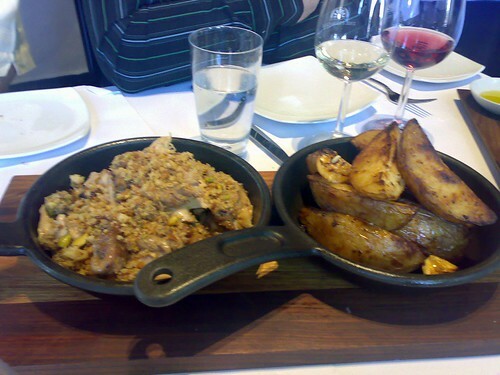 We return to The Press Club for our "christmas work lunch" and we opt for the lunch Kerasma (degustation) with matching wines, beginning with a glass of Ruinart Champagne. Now we haven't taken a photo of everything had - so head here and here for our other Press Club meals. 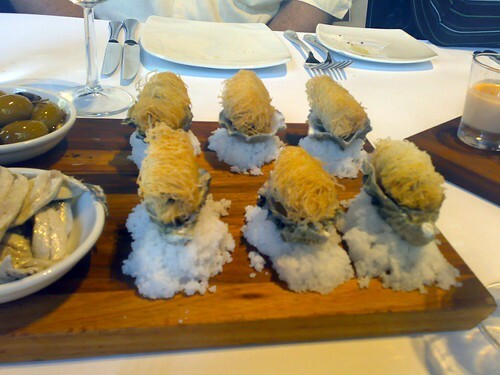 Part of the cold antipasto platter - smoked oyster wrapped in Kataifi pastry on caramelised onions served with shot glasses of greek salad smoothie. These weren't those tinned smoked oysters, they are smoked in house and have a most delightful aroma. They are to be eaten with the shot of greek salad smoothie - the smoothie wasn't liked by all. The zucchini flowers were simply fantastic and the quail just perfect. 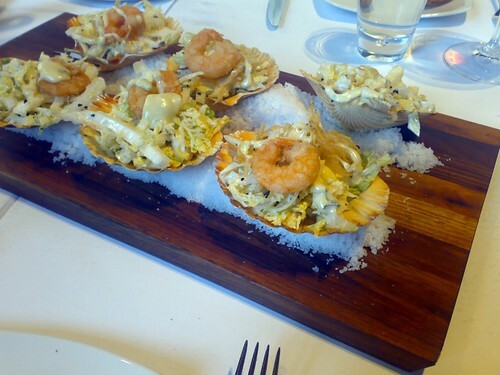 Grilled half shell scallops, atherina and baby prawn coleslaw - atherina are those tiny whitebait. Just an excellent combination of flavours and textures. Rotisserie Chicken under a crust of pistachio, lemon and breadcrumbs served with roasted garlic potatoes. It would be impossible to convey how good this chicken was - succulent doesn't do it justice and the topping was something you'd want to make sure you've eaten every last bit of. Desert, as usual was the Dessert mezedes.